Harry Potter, along with his best friends, Ron and Hermione, is about to start his third year at Hogwarts School of Witchcraft and Wizardry. Harary can't wait to get back to school after the summer holidays. (Who wouldn't if they lived with the horrible Dursleys?) But when Harry gets to Hogwarts, the atmosphere is tense. There's an escaped mass murderer on the loose, and the sinister prison guards of Azkaban have been called in to guard the school. 'The most eagerly awaited children's book for years.' - "The Evening Standard". 'The Harry Potter books are that rare thing, a series of stories adored by by parents and children alike'. - "The Daily Telegraph". 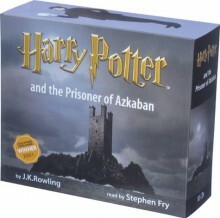 All the Harry Potter books are now available in large print. http://lorimurray.booklikes.com Lori's Little House of Reviews. 5.0 So far, my favorite book still. text So far, my favorite book still.